This forex scalping system is not for beginners. 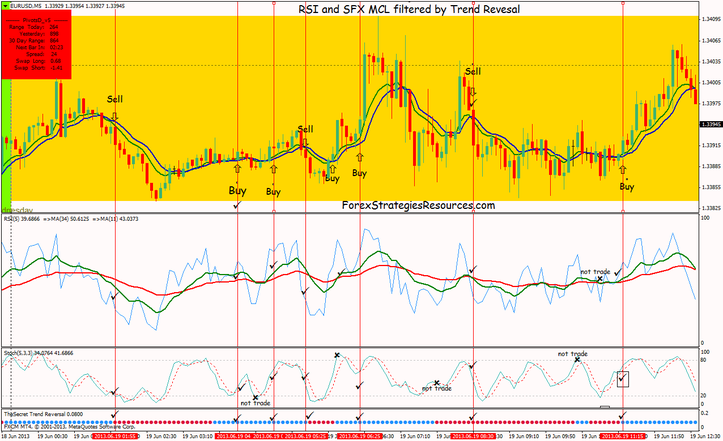 In this forex scalping system Stochastic indicator is a great filter. Currency pairs major: (EUR/USD, GBP/USD, USD/CHF, USD/CAD, AUD/USD,). Stochastic indicator crosses upward but is not in oversold Zone. Stochastic indicator crosses downward but is not in overbougt Zone. Stop loss 10 pips below or above the entry bar. This Scalping System is also good for binary options trading, see more. This System is based on the Reversal Trend indicator, SFX MCL indicator, RSI with moving averages and stocastic indicator as filter.